My name is Dirk-Jan Zetstra. 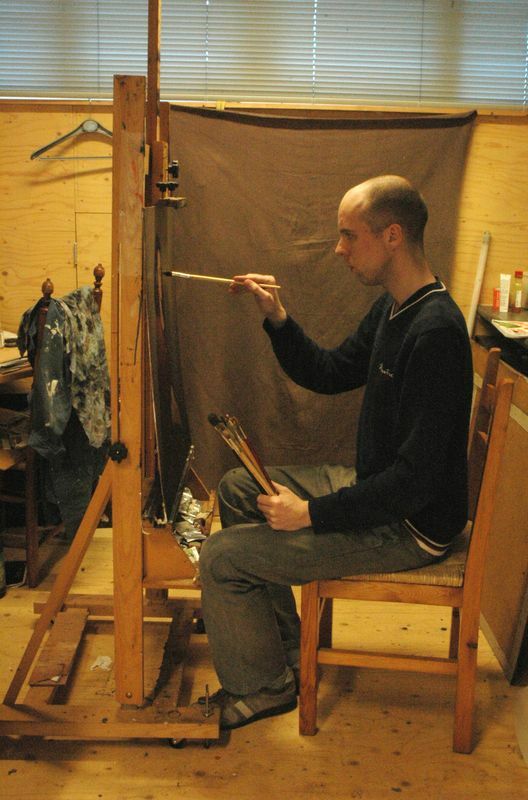 I was born in 1984 in Groningen, The Netherlands, where I still live and also have my studio. As for most artists drawing and painting is in my blood and I was busy with it from early childhood. It also runs in the family. My father had wanted to become a painter as well, but was advised against it as it is hard to earn a living that way. His enthusiasm for art he passed on to me. When at first drawing as a hobby, I noticed that I had been given a talent for it. I decided I wanted to develop those talents. I started by following studies in graphic design in Zwolle. During my studies, however, it became clear to me that graphic design consists of a lot of computer work and little drawing. So I switched to Art Academy Minerva in Groningen to study painting. I graduated in 2010. I work with oil paint on canvas. I always start with a layer in grey tones to create a tonal unity. Next I apply thin layers of colour: layer upon layer and colour upon colour to obtain optical effects, depth, and deep and lively colours. I only work with earth tones, blacks and whites to prevent the colour from drawing too much attention to itself. In this way I try to capture a stillness that is timeless. I also work with a knife and thick layers of paint in order to create a thick texture and optical effects. The so called ‘clair-obscur’, the contrast between light and dark, plays an important role in my work. My paintings are often genre pieces portraying daily scenes with people doing their day to day activities. Lately I have started to make oriental works, often with a biblical background. I also make portraits in commission. The concept of vanitas is an important theme in my work. Vanitas means ‘idleness’ or ‘transitoriness.’ ‘Vanity of vanities,’ says Ecclesiastes, ‘everything is vanity and chasing of wind.’ It is a theme that was used by many painters of old. What is the meaning of existence? You work, eat and do things, but to what end did God create us? To love God and our neighbour as ourselves. That is why I am so fascinated by human beings, who are the crown jewels of creation and stand closest to God. The play of light in my paintings discloses something the meaning of our human activities, as if human beings are toiling and labouring in the light of God to develop the earth. 1. 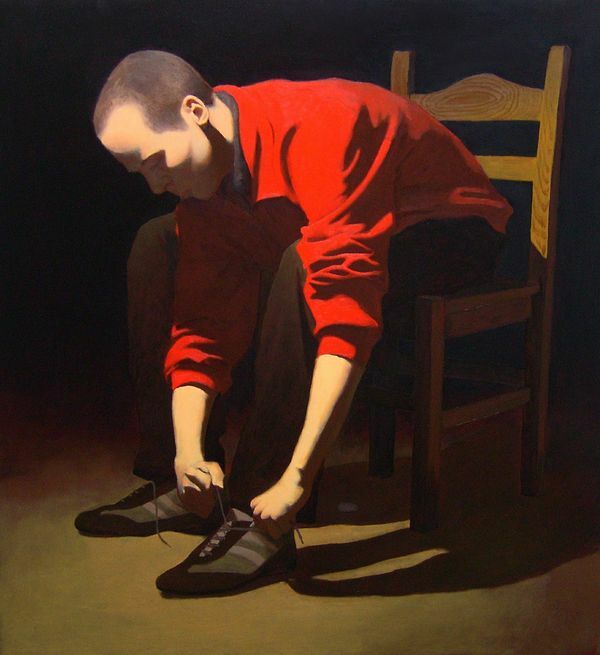 Tying Shoes, 75 x 65 cm, oil on canvas. On this painting you see a person who is tying his shoes. Located under the chair is a coin. Money, possessions and prosperity are all things that can make us trip, when they start to dominate our lives. Therefore be vigilant and do not serve the Mammon. 2. 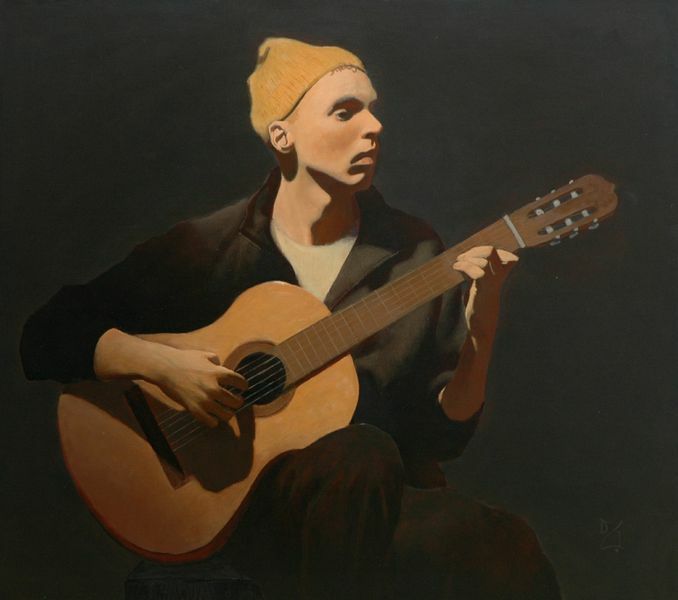 Guitar Player, 62 x 70 cm, oil on panel. If one thing is transitory, it is musical sounds. When a musical instrument is being played, whether a guitar, a flute or another instrument, it comes to life. But when the music stops, it is as if it was never there. The vanitas and fleeting character of life is central here. 3. 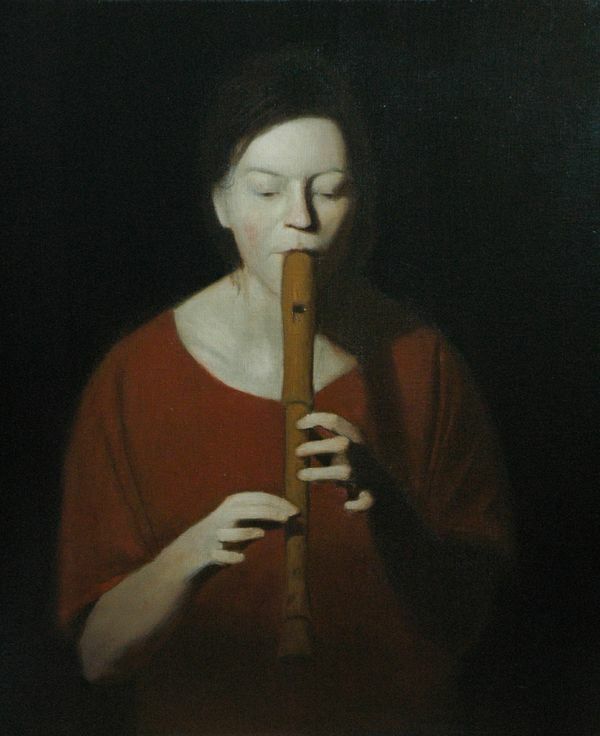 Flute Player, 55 x 65 cm, oil on canvas. See the description of Guitar Player. 4. 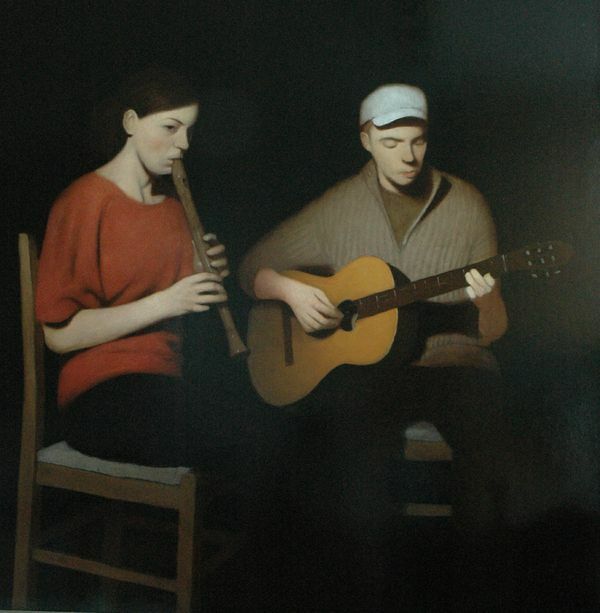 Musical Company,100 x 100 cm, oil on panel. Also here the temporariness of music is central. Playing together, being together, will end. 5. 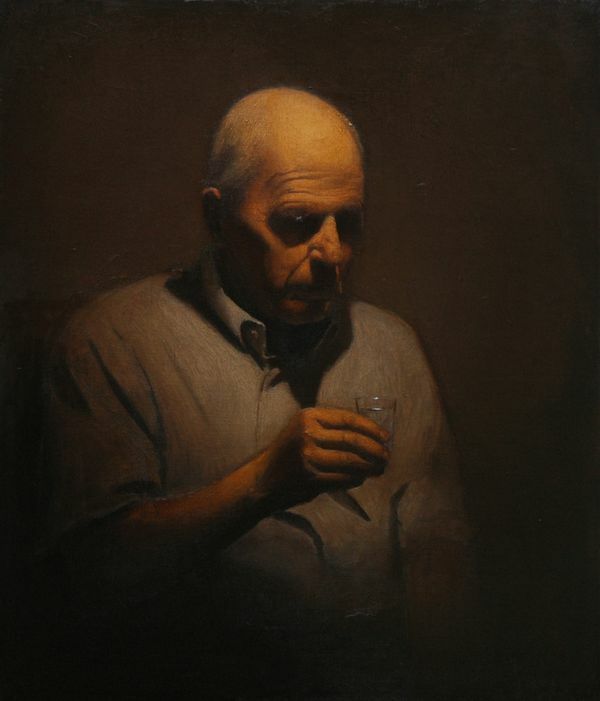 Man with a Drink, 70 x 60 cm, oil on canvas/panel (marouflé). Here we see a man having a drink. By drinking alcohol the old man wants to intoxicate himself in order to forget his mortality and old age. 6. 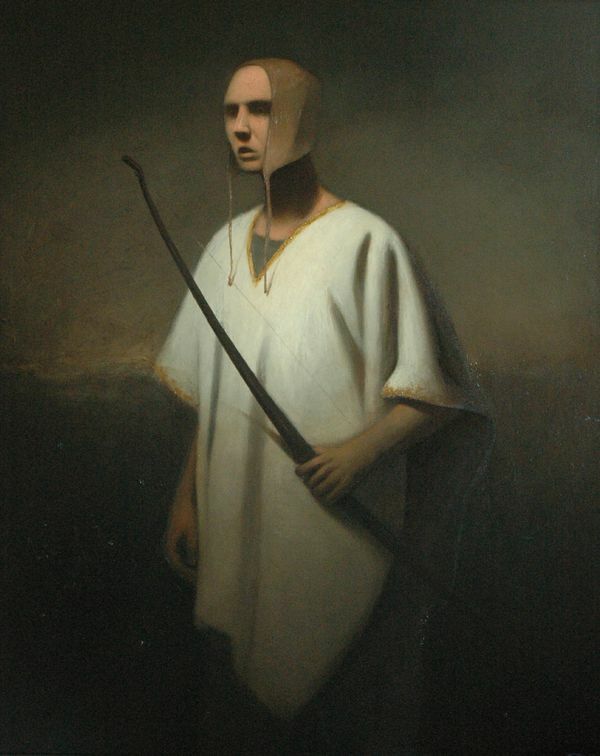 Man with Bow, 110 x 90 cm, oil on canvas/panel (marouflé). This is my first oriental work. The man’s cloths and the weapon in his hand make him look like someone from a different world. The viewer can set his imagination to work: maybe the man comes from the time of the Bible, perhaps being one of the heroes of David. Maybe he is from the Middle Ages. Aweg 47/48, 9718 CX Groningen. Gallery open on Thursday, Friday and Saturday 1 – 5 p.m.